If you have ANY plans to sell your home within the next, say, 10 years, I do not recommend dipping your bathroom in a vat of mosaic glass tiles. I know they are stunningly effervescent especially in cool swimming pool shades of blues and greens, but my gut tells me that the extreme application of almost any material will become the “avocado green” of the next generation of home buyers. 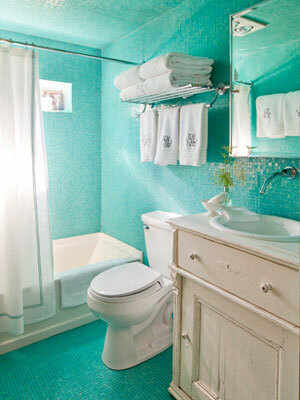 When Leslie Marshall cautioned, “Choose your color confidently because retiling can be a costly venture,” (http://www.bhg.com/decorating/color/colors/add-color-without-paint/) she might have added that you should think twice before tiling every surface at ALL! The alternative? Think longevity for your bathroom. Add trendy color in ways that will be switched out easily either by you or whoever gets to whip your home into shape for resale. A little bit of tile color in the bathroom– on the floor, in the shower area, or around the mirror–will go a long way toward modernizing your bathroom without taking the room over the top. Totally agree. I love your site, Kristie! It’s nice to hear from other professionals! You are currently reading When Tiling Goes Over the Top — Literally at Your Home & Color Coach.